Love is in the air. Everywhere I look around. Well, especially at this time of the year it is. I was asked to write this short blog whilst sitting in the services on the M6 on my way to Glasgow for a joint event with our colleagues from Companies House. There is often confusion with regard to company name and trade marks, so we often work together to clarify the situation. Registering your business at Companies House does not give you trade mark protection. But your company name could be registered as a trade mark if it meets the registration criteria. A trade mark is a sign which distinguishes your goods and services from those of other businesses. Anyway, what could I write about? What could give me inspiration? How could I work IP into St Valentine's Day? I walked back to the car, rejoined the M6 and after a couple of miles, there it was, on my left a sign post to Gretna Green. Most people of a certain age will instantly know the name, even if you haven’t been there. 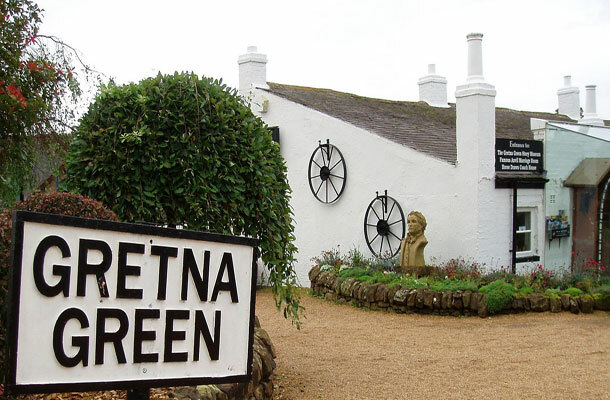 The name Gretna Green is evocative of young star-crossed lovers eloping to marry without the permission of their parents. The small Scottish village established itself as the ultimate marriage destination following a 1754 English law which stopped couples under 21 marrying without their parents’ consent. Situated just north of the Scottish border, it was permitted for couples to marry on the spot. The law only required two witnesses and the assurance that both parties were over the age of 16. And so, its place in history was sealed. Protecting a place name as a trade mark is actually quite difficult. Geographical names associated with particular goods or services cannot be registered. the place to which or from the services are provided. Indeed the Manual of Trade Marks Practice has a full chapter dedicated to the registration of geographical names. So is Gretna Green protected with trade mark registration? A search on our free data base shows that there are two applications currently on the register. A European registration was accepted as recently as January this year. A UK application is currently being processed (at time of writing). It was applied for by Gretna Green Ltd, a family business established in 1886. More than 1000 weddings and 200 blessings still take place within the Famous Blacksmiths Shop every year. So it seems love is all around us. Just remember to check first if it is has a registered trade mark, otherwise you could end up broken-hearted.